Pet friendly hotels Myrtle Beach are plentiful. Read up on historic Myrtle Beach and then set about planning what could be, one of your finest pet friendly vacations. You will find there are 40 pet friendly hotels Myrtle Beach each with its own Southern Carolina charm. This is a popular destination for those traveling with pets so booking early is essential. There are a few favored pet friendly hotels in Myrtle Beach that stand out from the others that we would like to share with you. Sonesta ES Suites Myrtle Beach is a warm and lovely all-suite hotel. Tuesday through Thursday guests enjoy an evening reception with a small meal and beverages. It features a kitchenette, free Wi-Fi, 24-hour fitness center and tennis courts. Shopping at the Myrtle Beach Boardwalk is but four miles from this quaint hotel. This is one of the more popular pet friendly hotels Myrtle Beach, as pets are truly welcomed. Westgage Myrtle Beach Oceanfront Resort sits upon the white sands of the Atlantic Ocean. It’s lazy river pool makes for the perfect way to float in paradise. There are kitchenettes with a microwave and refrigerator, making it conducive for family-style pet friendly vacations. There are a couple of dining options at this pet friendly hotel Myrtle Beach: the Seaside Cafe for breakfast and dinner and Coconut Willy’s pool bar for the perfect Pina Colada. The Market Common Suites by Beach Vacations feels more like a condo than a hotel, with fully equipped kitchens, private balconys and chic urban design. Each is furnished with a dining area. The South Beach Adventure Golf is but a five minute drive. Another of the pet friendly hotel Myrtle Beach that pets bark home about. La Quinta Inn & Suites Myrtle Beach Broadway area is another enjoyable place to stay. The grounds are pretty and there is an on-site fitness center and hot tub. Plus, it has laundry facilities on the premises. Make sure to visit Murrells Inlet Marsh Walk and you will be in the seafood capital of Southern Carolina. Plus, you will find plenty of pet friendly patios on which to dine where you and your pooch can enjoy a wonderful meal with the touch of a warm ocean breeze. This is one of the country’s most spectacular beach areas. In fact, the area has more than 60 miles of beaches. The water is clear and the sand is white. The sunsets and sunrises are breathtaking. Walk with your pooch along the white sands and you will have a feeling of peacefulness like no other. The shopping in Myrtle Beach also is grand. Find pet friendly parks and dog parks on our Myrtle Beach Travel Guide. For those who enjoy golf, there are more than 100 quality courses. It’s often referred to as a “golfer’s paradise.” Myrtle Beach also is home to WonderWorks and Ripley’s Aquarium. Enjoy Pirate’s Voyage and medieval Times, the Alabama Theater and The Palace Theatre. You will definitely have to find a pet sitter for these activities, but rest assured, there are plenty. 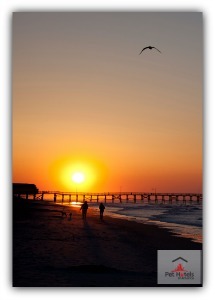 Visit our Myrtle Beach Travel Guide page. You also might want to read up on our Travel Tips, as traveling with a pet is a little different from traveling alone. So if you are headed out to one of America’s most beautiful vacation spots, make sure to use our travel guide and find what you need. Booking early is really important for popular destinations and this is definitely one of them.